Open both eyes to shoot! Shooting with both eyes open doesn’t work for every hunter, but when you can, you double your benefits. When I asked two experts about shooting with one eye versus two eyes I expected different answers. They did agree on one question however; how easy it is to determine your dominant eye. 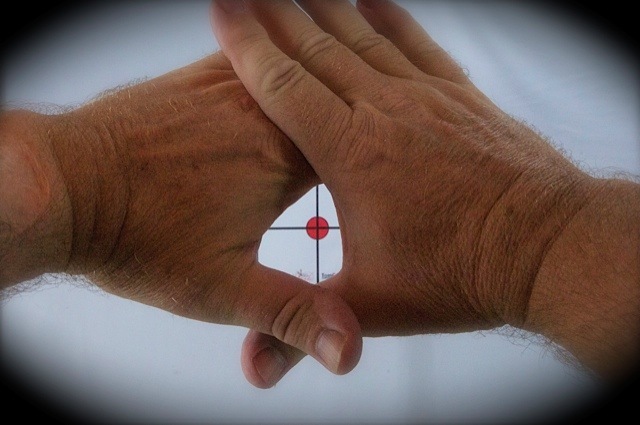 Simply lock your hands together out at arm’s length and make a small triangle by your thumbs, then view your “target” about 15 feet away through the tiny triangle in your hands That grey matter behind your dominant eye will choose which eye will actually focus on the object. Eyes are about 3″ apart, both eyes cannot maintain the direct line-of-sight to the object. Your dominant eye takes over, and you’ll naturally position your hand more to the right if you’re right-eye dominate, or slightly to the left if you’re left-eye-dominant. What ever eye that takes over and maintains the sight line is your dominant eye. 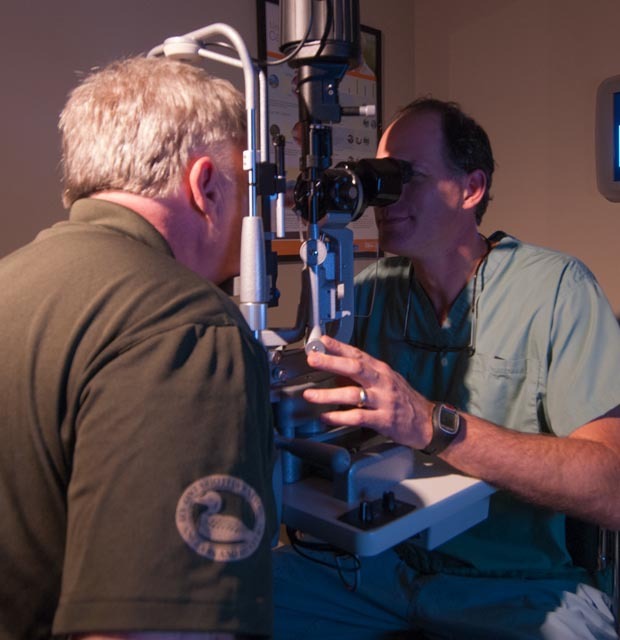 During my eye exam with Dr. Christopher Anjema CEO of the Anjema Eye Institute he mentioned, “ Start by having your eyes checked if it becomes difficult to focus on a stationary target or moving like a blurry target. Also when driving if an approaching vehicle lights have a halo effect around them”. He continued, “ Cataracts become cloudy due to aging eyes, diabetes or damaged caused by harmful UV rays”. Younger shooters in 20-30 year old range often get laser surgery performed (Lasik) that reshapes the lens. This is different from cataract surgery where the lens is removed and replaced. 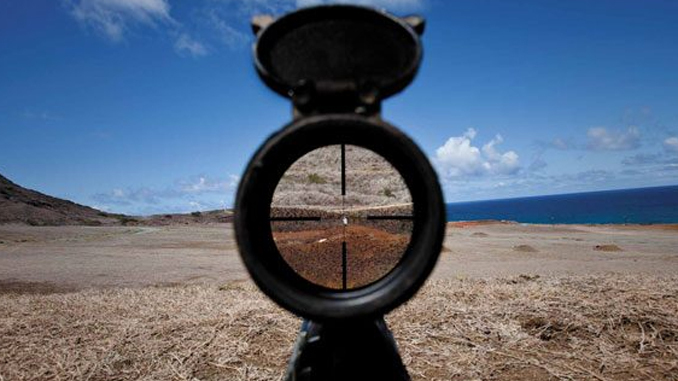 Shooter’s that close one eye loose their ability to distinguish depth of field and objects appear flatter. Where as when both eyes are open (or your non-dominant eye squints) it is easier to establish distance and path of the target. There is additional light transferred to your eyes enabling more peripheral vision in a moving target like a duck or clay bird. Your non-dominant eye acts like a set of binoculars. Try this with your binoculars. Focus on an object in the distance, then place your hand over the front of the left lens, repeat and cover the right lens. What did you see? Hopefully a full wide view nice and clear each time. Many shooters tape a black patch onto the non-dominate lens of shooting glasses and shoot with both eyes open. I talked with the Charlie Summers CEO and inventor of EyePal USA. It enables your eyes to act like binocular visions yet still retain peripheral vision allowing more focused light in and full depth of field view. The pinhole is small enough that prescription lens aren’t affected. Bow hunters also found this product very effective in 3D target shooting and hunting. Cost is about the same as a box of ammo or a few arrows. Charlie said it seemed to work like magic but it was just simple science. There was also has a great guarantee included with each set. 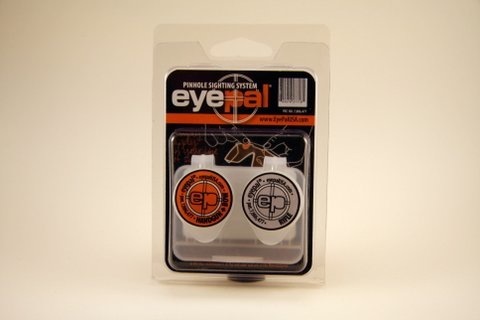 I have learned however using a shooting aid like the Eye Pal will help train your eyes and you’ll become accurate and proficient immediately. 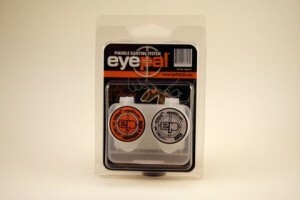 The EyePal USA works really well for archers and awesome for firearms like shotguns and handguns with open sights. 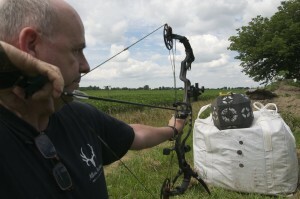 Jerome Atkins owner of Atkins Archery shoots naturally with both eyes open at the 3D shoots were we often meet up. I asked him how he trained to shoot like that? Jerome said “Start about 1-2 yards away from the target open your dominate eye to get a good sight picture then try to open the other eye or squint if unable to open it fully. Gradually increase the distance from he target, as your non-dominant eye remains open. You will eventually train your eyes to remain open when shooting with lots of practice. 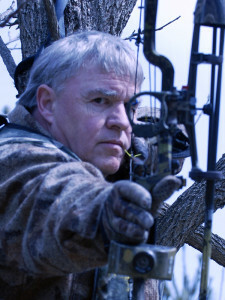 Just ask Atkin’s Archery owner Jerome Atkins as he demonstrates shooting a bow with both eyes open. Some shooters like myself were hand and eye dominance are opposite might create a dilemma for hunting and target shooting. Practise, Practise and more Practise is the cure. Shot gunners use an instinctive method to take advantage of a body’s natural pointing abilities. Your brain and body already know how to hit a flying target, so capitalize on those natural abilities and allow your subconscious to do it. Take a normal stance, with weak foot forward grip stock with your strong hand as you normally would. Then with your weak hand, the one holding the gun’s forearm, extend your index finger so it points in line with the barrel either directly under the forearm or alongside, both positions work so just be comfortable. Pointing with an index finger is important because you will use it to point at the target, the shotgun simply becoming an extension of that pointing. Your dominant eye must lie directly in line with your shotgun’s barrel for this to be effective. So what does all this have to do with shooting a bow or firearm with open sights? In some cases, nothing. If you plan to shoot your bow by closing one eye and sighting with the other it doesn’t really matter whether your hand and eye dominance match or not. However, most serious archers and shot gunners can learn how to shoot with BOTH EYES OPEN. Shooting with both eyes open gives you a much crisper brighter natural field-of-view. The dominant eye focuses crisply and does the actual “sighting” through the restricted area of the peep sight, and the other eye “fills in the gaps” in the picture like binoculars. Archers who shoot with both eyes open will also notice another benefit. 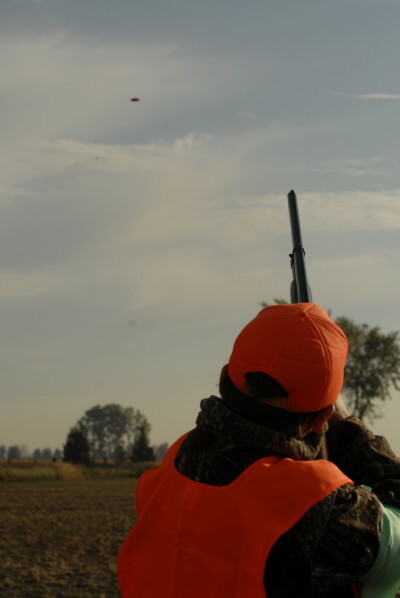 It’s easier to follow arrow flight to the target and shot gunners will see the clay break or duck drop. Shooting with both eyes open certainly has its perks. A shooter eyes and brain already know how to hit a stationary or flying target, so capitalize on those natural abilities and let them do it. Remember, practice practice and more practice!